NetApp and Google Cloud are proud to bring you Cloud Volumes Service for Google Cloud Platform. 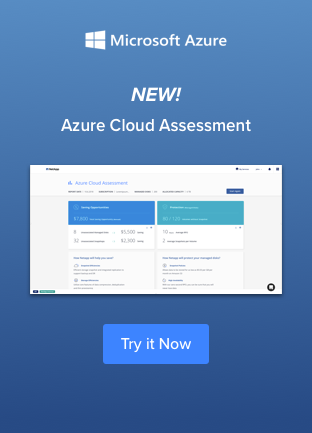 This blog focuses on identifying the envelope of the service—that is, what you can expect from your enterprise application when it’s built on this new and robust cloud-native NAS storage service. How many IOPS can Application X generate against a single cloud volume? How much bandwidth can Application X consume against the same volume? How much bandwidth can Application X consume in total in the GCP project? What response time can Application X expect? The results documented below come from Vdbench summary files. Vdbench is a command line utility that was created to help engineers and customers generate disk I/O workloads to be used for validating storage performance. We used the tool in a client-server configuration using a single mixed master/client and 14 dedicated client GCE instances—thus scale out. Before going any further, let's talk about the environment we used in our tests. All tests were conducted in the us-central1 GCP region. At the project level, GCE instances are currently provided approximately 13Gb of redundant bandwidth (26Gb usable) in total to access the Cloud Volumes Service. This limit may be raised in the future. To understand the bandwidth available to a GCE instance, you must understand that inbound and outbound (read and write) rates are not the same. Writes to the cloud volume service are rate limited by GCP at 3Gb per second. Reads from the Cloud Volume Service are unrestricted. Although rates up to 3Gb per second can be anticipated, testing has shown that up to 6Gb per second can be achieved. Each GCE instance must have enough bandwidth in and of itself to achieve these numbers. Why trust the documentation? Find out for yourself by using iPerf3, a tool for active measurement of the maximum achievable bandwidth on IP networks. GCE instances of type n1-highcpu-16 were used for most of the testing described in this paper. Running iperf3 from two n1-highcpu-16 instances shows that this machine type has 5Gb of bandwidth. Volume network bandwidth is based on a combination of service level and allocated capacity. However, the total bandwidth available to all volumes is potentially constrained by bandwidth made available to the project. Bandwidth calculations work as shown in the following table. For example, although two volumes allocated 10Gbps of bandwidth each may both operate unconstrained, three volumes allocated 10Gbps each are constrained by the project and must share the total bandwidth. The following graph demonstrated the amount of random I/O a customer could expect to achieve with multiple clients against a single GCP cloud volume. The test reveals that the maximum I/O in that scenario is ~242k 8KiB IOPS. While the previous graph documents the random I/O potential of a single cloud volume, this next graph does the same for sequential workload. The tests were run in a similar manner using one to many CentOS 7.5 Linux GCE instances as the Vdbench workers. In this case the maximum amount of bandwidth that could be consumed represents the totality of that available in the project. As stated in the “Project-Level Bandwidth” section, a project presently has ~26 gigabit of total bandwidth which equates to 3,300MB/s as shown below. 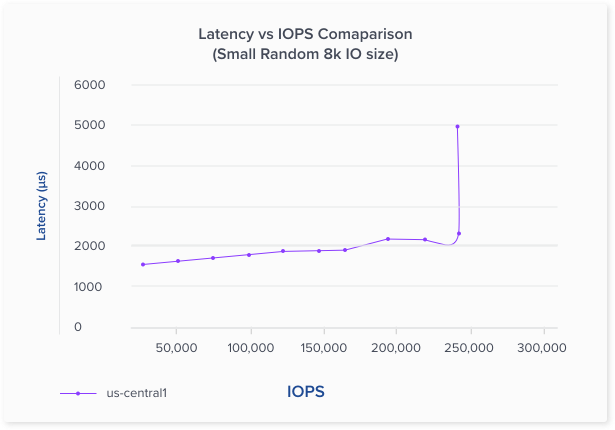 Applications may benefit from the excellent network latency seen across the board in GCP, run from within the us-central1 region, ~168,000 8K random read IOPS were achieved at less than 2ms and ~225,000 IOPS just past the 2ms point. Collectively, the GCE instances in a GCP project have roughly 26Gbps of aggregate bandwidth in relation to the Cloud Volumes Service (the bandwidth limit may be raised in the future). Individually, each GCE instance may read between 3Gbps and 6Gbps; writes are constrained to 3Gbps. As the application architect, you allocate volume bandwidth enough for the needs of the Application X, either scale up or scale out, within the constraints of the environment just defined.